U.S. study abroad continues to grow in the United States, with 332,727 Americans studying abroad for academic credit at their home institutions during the 2016-2017 academic year. This newest number, unveiled in today’s 2018 Open Doors Report on International Educational Exchange, represents a 2.3 percent increase from the number of American students studying abroad the previous year. Approximately one in 10 U.S. students study abroad during their undergraduate career. 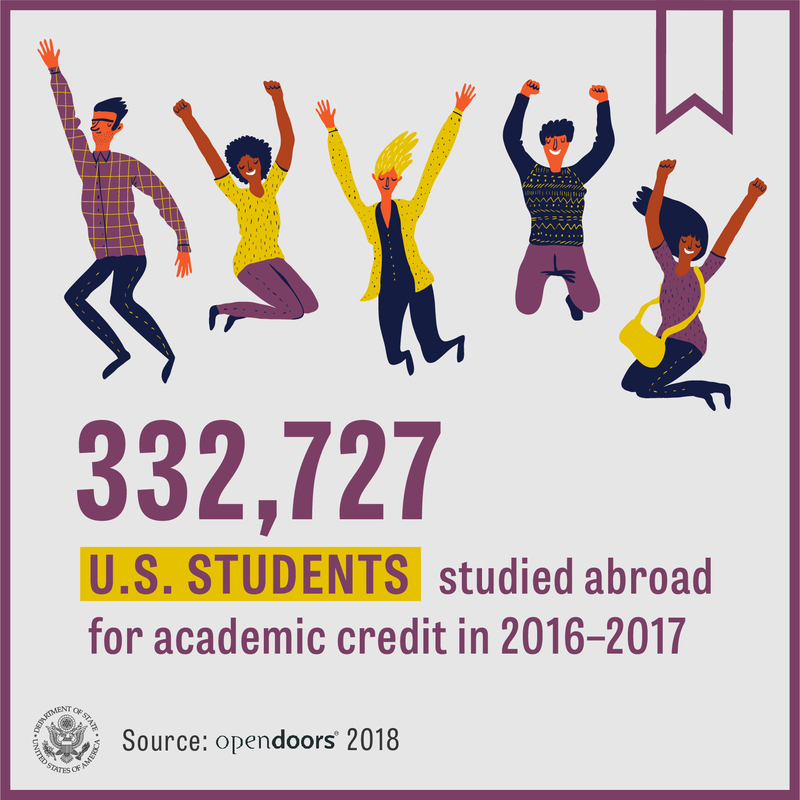 In addition, Open Doors 2018 shows that the profile of U.S. students going abroad continues to diversify. The number of students who identify as racial or ethnic minorities who studied abroad in 2016/2017 was 29.2 percent. In 2005/06, racial and ethnic minorities accounted for only 17 percent of the study abroad population. To help develop these future leaders, USA Study Abroad works to increase the number of students who study abroad, the types of students who study abroad, and where those students study. Every year, USA Study Abroad sends 3,000 outstanding undergraduate Pell grant recipients to study and intern abroad on the Benjamin A. Gilman International Scholarship Program. During the academic year 2017-18 program, these students came from 607 colleges and universities in all 50 states and went to study or intern in 113 countries. Forty-seven percent were first-generation college students, 65 percent represented racial or ethnic minority groups, and 55 percent studied in countries where fewer Americans go abroad. USA Study Abroad also sends 550 students overseas each year on the Critical Language Scholarship (CLS) Program to study one of 15 languages deemed important for U.S. national security and economic prosperity. Last year’s CLS students came from 730 colleges and universities in all 50 states. Forty percent identified as racial minorities and 27 percent were first-generation college students. Learn more about trends in U.S. study abroad by viewing the Open Doors report here.